How to capture video of my desktop? How to capture video of your desktop with your voice comments. 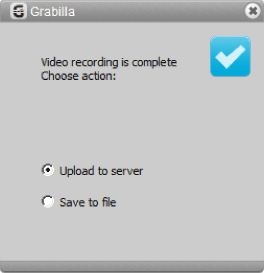 You can capture video of your desktop activities with Grabilla – give it a try. To capture video you need to check Video mode checkbox and after that Grabilla will capture video instead of static picture. You need to select desired area for video capturing or you can capture screencast of entire desktop. 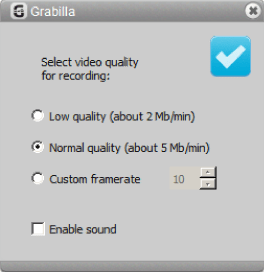 Grabilla will show you a dialogue where you can select video recording quality for capturing and switch on or off voice recording options. For video recording quality choices are: Low Quality (~2 Mb/min), Normal quality (~5 Mb/min), or Custom framerate for capturing. After selecting video quality, and pressing ✔ button you will see red blinking border around capturing area. When you want to stop video capturing you had to click on this floating button in top right corner. Here’s sample video of this button in action. After you press Stop button, you can decide what to do with this captured video – Upload to server for quick sharing with your friends, or just Save to file for later editing. If you select Upload to server, progress bar will appear and you can watch your video uploading progress. After upload finished, you will see the link to your uploaded video in new browser window. Btw, Is there a possibility to switch off that blinking frame. Could be an option.? We will try to make this blinking red frame configurable in next release, so it can be switched off in settings. If some one wishes to be updated with most up-to-date technologies then he must be visit this web page and be up to date everyday. This is my firwt time pay a visit at here and i am really impresszed to read everthing at one place. I am sending it to several friends ans additionally sharing in delicious. And naturally, thank you to your sweat! I really like the info you present here and can’t wait to take a look when I get home. I’m shocked at how fast your blog loaded on my phone.. I’m not even using WIFI, just 3G.. Awesome things here. I am very satisfied to look your post. Thanks a lot and I am looking ahead to contact you. I simply want to mention I am just very new to blogging and seriously loved you’re web site. Likely I’m planning to bookmark your blog . You surely have superb articles and reviews. Regards for sharing with us your web page. Today, while using share function two messages to two different email accounts were not delivered to intended mail-boxs. Weather this error on sending side or receiving side, is not clear. Other than that this site seems to be great.